NORFOLK, Va. (WVEC) -- Police have identified the three men who were hurt in a shooting in Berkley Tuesday that was broadcast live on one of the victim's Facebook pages. The shooting along Bainbridge Boulevard happened around 6:10 p.m. Moments before the shooting, T.J. Williams was sitting in a car with two other men listening to music in the live Facebook video. When the gunfire erupts, Williams drops the phone as pieces of glass fly through the car. The shots continue for 20 seconds. Neighbors say they heard as many as two dozen rounds. Several seconds after the gunfire, neighbors are heard coming up to the car to comfort the three men. "Give me your hand. Stay relaxed. I got you. Stay relaxed," said one person after paramedics were on their way to the scene. "They're coming. They're coming to get you." The men, ages 27 and 29-years-old, were taken to Sentara Norfolk General Hospital with what police described as significant injuries. The live Facebook feed continued for more than an hour after the shooting and recorded police as they secured the crime scene. Detectives have confirmed the video posted to the social outlet is of the actual incident. All three victims remain hospitalized. Two are in stable condition, but one is suffering from significant injuries. They have not released a motive or any suspect information. If you know anything about this shooting call the Crime Line at 1-888-LOCK-U-UP. Three men were taken to Sentara Norfolk General Hospital following a shooting Tuesday evening. 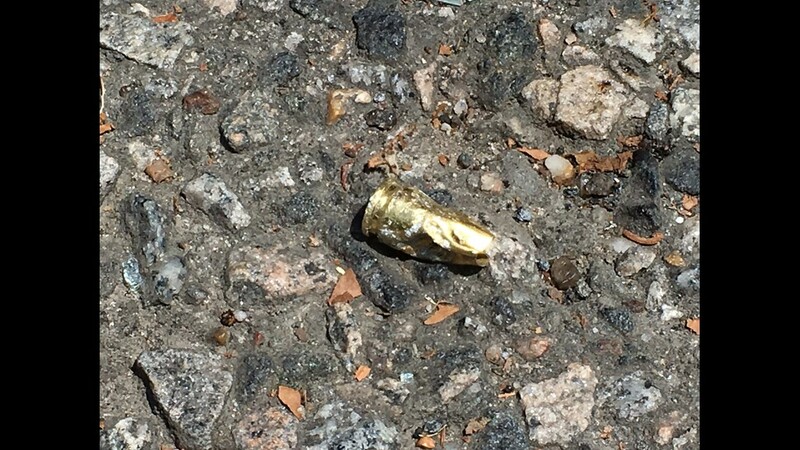 Bullet fragment seen on the ground where the three men were shot during Facebook live video. Three men were taken to Sentara Norfolk General Hospital following a shooting in Norfolk.